Bed Bugs are very small (at the largest about three by five millimeters) nocturnal creatures and can feed on their hosts without being noticed. 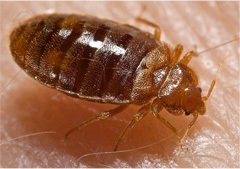 Bed Bugs are resilient and can survive in many conditions, however they are unable to survive high temperatures (about 113 degrees Fahrenheit and higher) for more than a few minutes, which is important to know if dealing with an infestation. The average bed bug feeds once ever five to ten days, but they can survive up to a year without feeding! The common Bed Bug likes to live in areas where humans sleep – beds, mattresses, sofas, and so forth. It is attracted to the hosts it feeds on by means of warmth, its ability to detect carbon dioxide, and by certain chemicals it is able to sense. The bug feeds by piercing its host’s skin with a ‘stylet fascicle,’ essentially a small tube it keeps close to its body. It takes a bed bug between three to ten minutes of feeding to become full. Bed bugs have been around for thousands and years and are thought to have originated in the Middle East, where they would have lived in caves occupied by humans. With the world’s eventual urbanization, the bugs were able to move around the world, possibly in transportations of goods such as wool, and eventually made it to urban centers. It has been hypothesized that the insects became significantly more common after the invention of modern heating, which allowed them to live in homes year-round and not die in the winter. At one point of time, bed bugs were nearly forced to extinction by the introduction of the pesticide DDT. The pesticide has since been banned as it was found to be harmful to humans as well.